(First reviewed on my blog in 2008. )This is a special review for me. First of all, Dusk Peterson, like me, is a self-published author. Second, Dusk has worked hard to publish a quality story, done the footwork necessary to knowing how to self-publish, shared the knowledge gained from that footwork, given stories to beta readers for criticism, polished those stories and polished them again.I was one of Dusk’s beta readers. Bard of Pain is not the only story by Dusk that I’ve read. A few years back, I also “beta’d” Mystery and Rebirth (The Eternal Dungeon). Dusk has been kind enough to list me as an editor of Bard of Pain before I could in fact claim to be one. I’m honoured to have read these stories, let alone have Dusk consider my opinions of them. I learned from this author. I had surprises while reading, surprises that inspired.In all three stories, I discovered compelling characters who were confronting problems capable of destroying a human being, sometimes physically, definitely mentally. But there’s something very special about Dusk’s dark fic. Dark, very, but there’s this smidgen of light in every cavern Dusk throws a reader, and the brightness of that light is practically overwhelming by the time you get to the end of the novel, and it is like crawling to the opening of a cavern. It’s like getting a miracle.I’m not exaggerating. Follow any of Dusk’s protagonists through a story and you’ll not only glimpse the mind of a troubled being, you’ll see that character’s transformation. You’ll witness a moment of revelation. Sometimes, just like the character, you won’t see the revelation coming. You’ll feel it looming, but you just won’t see it. It’ll be like rocks tumbling out of the way, unveiling that light I spoke of.Bard of Pain is a story about a young man who seems to exist to torture people. Warfare makes it easier for him to enact his blackest desires. 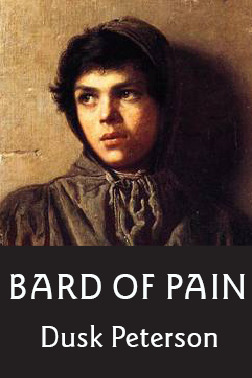 He becomes an officer and serves the Northern Army as a torturer, though extracting information from prisoners is hardly the most satisfying or true reason for which he commits atrocities on another human being.When you read Bard of Pain, you might find yourself despising the protagonist, but you’ll be fascinated all the same. Surely, he’s going to be damned for all his evil acts. Surely, he’ll get what he deserves.He does.Oh, spoiler, right? No, not really. Read the story. Let Dusk throw you in a cavern and tumble some rocks for you. That promised bit of light I mentioned beforehand? It’s well worth chasing. This story is very dark with its tale of betrayal. The story flips back and forth in time, making the story complex.Probably though the most telling part for me was the section where the Commander is questioned about why he invaded the other lands.Time, it seemed, was going backward. Quentin-Andrew could now see the scenes he had witnessed before – the wide arc of destruction growing narrow and yet more narrow, until it began to center on its origins: particular places, particular acts, particular men. The Great Peninsula no longer held any trade routes; this was due to the greediness of the Commander's troops, who plundered the goods of merchants. The Great Peninsula no longer possessed ambassadors or peace treaties; this was due to a peace oath that had been broken long ago by one of the Commander's emissaries. The Great Peninsula no longer contained mighty men and women, capable of upholding the law; their graves could be seen, or in some cases simply their bodies, when the Commander had not bothered to order their burial. "This makes no sense." The Commander's voice wavered. "How could the gods punish me? What I did in the war, I did for their sake, to bring peace. War is evil – I always said that – but I had no choice in my methods. My enemies forced me—"...Quentin-Andrew looked over at the Commander. He was on his knees, hiding his eyes; he had not witnessed the final scene. "I had no choice," he whispered. "No choice, sir?" Quentin-Andrew allowed his voice to take on a note of scorn. "You had no choice but to do what you did – is that what you are saying? "He waited. With any other man, he would have supplied the answer, but the Commander was capable of doing so on his own.The Commander's response was a long time in coming. Quentin-Andrew, shivering, wondered how many centuries were passing by. Finally the Commander said in a broken voice, "I could have retreated. I need not have continued the war. But if I had done that – if I had let Koretia exist under rulerless anarchy or if I had let Emor continue under a tyrant . . .""They would have been worse off than under your protection." The old excuse given by many a leader who blinds themselves to the consequence of their actions.The story is also about sacrifice, as the Lieutenant finally redeems himself by going down that road. Dusk Peterson - Honored in the Rainbow Awards, Dusk Peterson writes historical speculative fiction with diverse characters: historical fantasy, alternate history, and retrofuture science fiction. Friendship, romantic friendship, and romance often occur in the stories. Visit duskpeterson for e-books and free fiction. Dusk Peterson also runs Historicalfic: Historical Research for Fiction Writers (historicalfic). A resident of Maryland, Mx. Peterson lives with an apprentice and several thousand books.